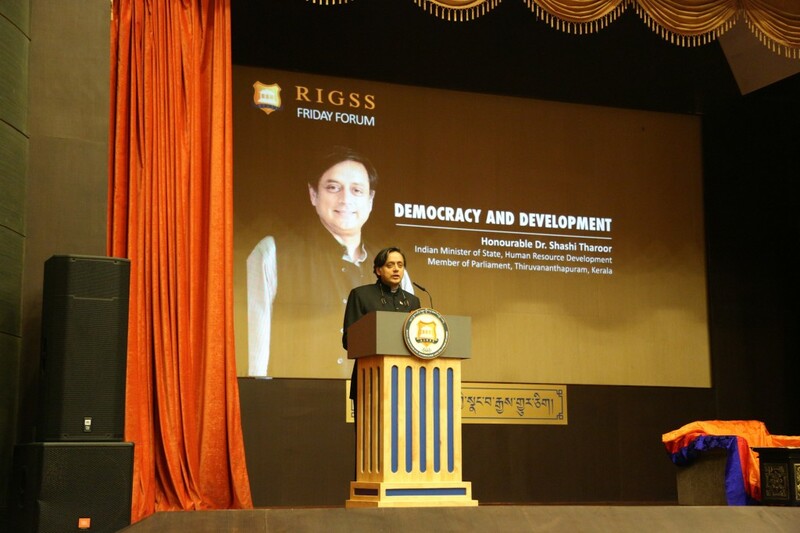 Dr. Shashi Tharoor, Minister of State for Human Resource Development, India addressed the Friday Forum at the Royal Institute for Governance and Strategic Studies (RIGSS) in Phuentsholing on 1 November 2013. The Friday Forum is a weekly programme at the Institute where various speakers come and speak on relevant issues. Dr. Tharoor’s visit was facilitated by The Thimphu Seminars and Mr. Arun Kapur, Chairman of The Thimphu Seminars, accompanied Dr. Tharoor to Phuentsholing. The talk was graced by His Majesty the King and the Gyaltsuen. The talk provided a lucid and comprehensive insight into the ideas of democracy and development, and how the two are intertwined. Democracy is a system to foster public reasoning and a means to human development. It is a response to the population and a means of reaching out to marginalised sections of society, creating an open discourse between the people so that their voices are heard and priorities noted. The process of free and fair public discussion and contestation, gives people the power to be stakeholders in combating social issues of a local nature without the state suppressing them or coercing the outcome. Dr. Tharoor stated that such constructive processes, which play a crucial role in developing the character of a democratic people, are unlikely to occur in an undemocratic state. Democracy and development are intertwined concepts; the advent of democracy is a signal of how development can and will flourish. Further, to allow people to be creative in pursuing their goals, democracy is a necessary condition. The insightful discussion left the audience optimistic about the story of Bhutan’s journey towards this transition.